You have to get this German-import CMA single. Limited edition, clear vinyl! 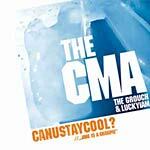 Two dope tracks taken from the CMA album, All Over. 1. Can U Stay Cool?